Leicester band Midnight Wire launches it new album Crossing The Rubicon in December. This article reviews the album which will be launched at a show on December 19th 2014, at the Y Theatre Leicester (with support from Casino Empire and Stop That Train). I can’t wait to see MW at the album launch on 19th December. It’s not just that I want to hear all those marvellous songs again; I love big gigs and have been to many, many previous shows put on by MW and The Heroes before them. They are iconic moments in the life of live music, as far as I am concerned. Lead singer Alex Van Roose has been telling me about Crossing The Rubicon for what seems a very long time. My sense of anticipation is overwhelming. Alex is one of the very best song-writers I know; since the launch of Midnight Wire, Alex has been a prodigious writer of songs, melodies and tunes. His knowledge of music – and of the people who work within it – is humblingly inspiring. This album is perhaps the flowering of MW’s musical career to date; if that is proven to be so, who knows what they could come up with in the years to come! Crossing The Rubicon is a collection of the some of the most likeable and memorable tunes I have hard from a Leicester band. We look at Midnight Wire – the band. Friday 2nd September 2011. Midnight Wire’s launch at Sub91. The members of Midnight Wire are no newbies, still wet behind their musical ears. Most of them had previously played in successful bands. So, as you would expect, they delivered their songs with a healthy dose of confidence. Their forty minute headline set was filled with exquisitely good songs; catchy tunes, compelling beats and memorable lyrics. From start to finish, the band unleashed one stonkingly good song after another. The crowd lapped it all up with relish. … On the lead mic, Alex Rooster Van Roose. Behind him on the skins Adam Horton. To Rooster’s left, guitarist Chris Merriman and on the bass, Arjan Johal. … On the lead mic, Alex Rooster Van Roose. Behind him on the skins Adam Horton. To Rooster’s left, guitarist Chris Merriman and on the bass, Arjan Johal. …Their set finished, the kids were not going to let them go. They had to come back for an encore, …They weren’t short of extra songs. Since their formation earlier this year, they have penned a catalogue of new songs that would have taken most established bands several years to complete. These guys are driven by youthful energy. Songs writers in the band have been doing a great job spinning out new tunes. With a launch like this, they have a defiantly bright future ahead of them. They are full of ambition, they are insatiably restless and they are dripping with adrenaline-fuelled talent. Artsin will be following their progress with keen interest. A band that has already created quite a following, Midnight Wire performed one of the best sets I have seen by a band in a small venue. 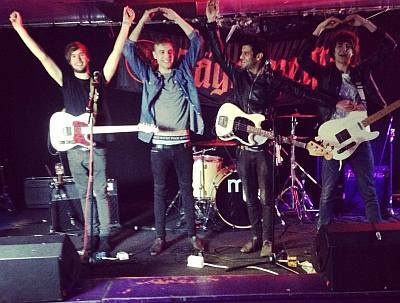 They belong at festivals, owning the stage and making us lot spill our beers while we attempt to dance. 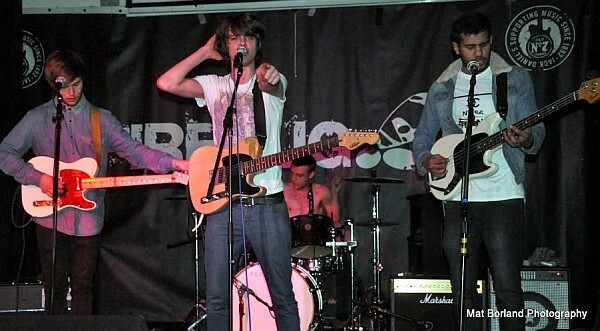 Melodic, fun, well written, very well performed, modern British pop rock. Playing a genre I don’t usually buy into, I was surprised that before they reached their first chorus I was already loving this band! Alex Van Roose is quite simply a star; a rare talent, a voice to fall in love with, a skilful guitarist and an absolutely amazing stage presence. The rest of the band are on a par with Alex; I was very impressed by Chris Merriman on lead guitar and found that I couldn’t take my eyes off of Nik Green on Drums, he is crazy good! Their songs are really catchy and get everyone moving; I particularly liked the song Excuses. Midnight Wire thoroughly deserved their winning spot in this OBS heat. [Arts in Leicester magazine, Saturday 31st March 2012. After a dramatic sound track, the four members of the band walked on to the stage to rapturous applause. The guys launched in to their set with their first bouncy number, laden with catchy hooks. New York City Lies has an engagingly jaunty rhythm and iconic lyrics and when it finished the crowd showed enthusiastic approval. As he introduced the second song, Oh Lola, lead singer Rooster drew the crowd into the action, commanding them to sing along with the chorus. Which they did with gusto. Enhanced by backing vocals from guitarist Chris Merriman, this was another song baited with catchy riffs and foot-tapping beats. At the start of the third song, Alex shouted “One, two” and the crowd resounded with “One, two, three, four …” and they were away with Honey and its plethora of syncopated rhythms and infectious riffs. Kings of the City has all the hallmarks of a hit song. You might as well be listening to The Clash or The Libertines. It was as good as anything they had. At the back of the stage Nik Green was working hard on the skins. Midnight Wire ended their set with with their punk speed song Never Gonna Leave LA. Even before the last chords died away the crowd was cheering and screaming. Eight classic pop/rock ballads without equal in our local area. … And the result? Jono (Jon O’Neill) announced that the 2012 OBS top prize had gone to Midnight Wire. Midnight Wire. (Strawberry Jam Stage). 2012. Y Theatre with Midnight Wire. Last year’s OBS winners – Midnight Wire – took to the stage to play their guest slot, capping a long night of right-royal rock with the songs that they have carried around the country during their tour, for which this was the final gig. Led by the vocals of one of the youngest artists to have performed at Glastonbury, MW brought out a smorgasbord of new and established tunes to show the rest of the assembled musos how it’s done. Honey, Excuses, Running Forever – MW played some of their best tunes and a few new ones for good measure. These are songs that grab you right from the start, they stick in your mind and the more you listen to them the more you like them. As they told me before the show, they had been to venues in various parts of the UK and played to people who had never heard of them before and came out having won over crowd after crowd. Watching MW on stage tonight, you see a well-oiled casualness about them, something seen only with bands that have toured and played extensively and to cap it all, Alex shouted “hands in the air Leicester” almost as though playing at the Musician was just another stop for the tour bus and none of the other bands used the word “Leicester” in their shout-outs to the crowd. Songs by Midnight Wire do not sound like those made by small local bands; they sound like national chart material. Running Forever, as an example, is one that stands up to scrutiny way beyond our local area … it’s got a magic in its memorable melodies and ear-licking guitar riffs that makes it stand out. Midnight Wire is the heir to the Heroes and to songs like Blue Rave and Flowers in Golden Times that drew praise from the likes of Zane Lowe and Jo Whiley. As the cheering died down, the OBS came to a close. Unlike some, I staggered off to my bed but as I walked home I reflected on what the OB Showcase has achieved in its eight years of sifting out the top bands of Leicester. Alex Van Roose is a singer and songwriter. He is the lead vocalist with Midnight Wire and was previously with The Heroes. Alex’s song writing has won him national acclaim. He is also a writer of solo tracks and has made several solo appearances. 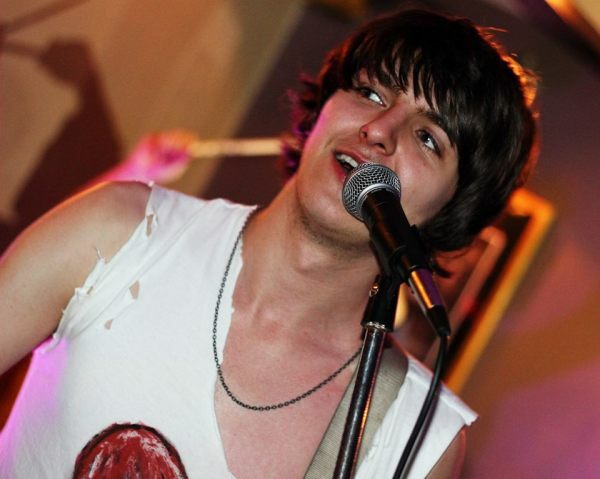 Having toured with both his bands across the UK, Alex has also toured with his acoustic set. Alex has previously had solo tracks featured by the BBC and most recently had his track Never Gonna Leave LA (with Midnight Wire) featured as BBC Radio 1’s track of the week. Don’t expect the high energy you would get with his band, but do expect it to be fun and full of surprises. So there you go; lots more has been written about this band but that’s a fair sample.